Last year Apple (NASDAQ:AAPL) had the best time as it became the first American trillion dollar company. Everyone wanted to own it near $230. But then after the October highs, buyers disappeared and AAPL stock fell into a death spiral. Sentiment on Wall Street soured abruptly and the equity markets went into a sharp correction. Stocks died by a thousand cuts. Investors were facing one bad headline after another, from tariff wars to rate hikes to slowing macroeconomics. Things were especially bad for AAPL stock. When its suppliers — most notably Taiwan Semiconductor (NYSE:TSM) — raised the alarm that iPhone sales were slowing down precipitously, Apple stock fell below $200 and off its trillion dollar perch. Then things got much worse when management pre-announced that they were indeed lowering expectations. The stock cratered more than 30% on the headline and all the way to $142 per share. What didn’t help AAPL’s cause was that they had just announced that that they would no longer report iPhone unit sales. Experts hated that fact and it contributed to its stock woes. It was like taking candy from a kid’s hand. For years, analysts used the iPhone sales count to drive the trader reaction on earnings headlines. This turned out to be a blessing in disguise during this last earnings report. AAPL management did exceed the lowered expectations and traders rejoiced. But had they reported iPhone unit sales, then it most likely would have been a reason for traders to sell it in size. Going forward, traders can no longer sell the headline off one metric. They are now forced to account for the whole company — not just how many iPhones they sold. And without a doubt, that’s better for AAPL stock in the long run. Most pundits agree that AAPL is reducing its dependency on the iPhone. Services and healthcare are two hot areas for the future. But I fear that they are moving too slowly. Nevertheless, in the past weeks there were even rumors that Apple could buy Netflix (NASDAQ:NFLX) — so maybe there is hope for something to happen soon. Of course, after AAPL stock had corrected, not many experts would recommend it. So when they reported earnings that weren’t a total disaster AAPL went into a slingshot rebound. It rallied over 20% from the December lows to $175 per share. While still far from the all time highs this is a marked improvement and a swift rejection of the lows. The fundamentals are as solid as they come for years to come. AAPL sells at a 14 P/E ratio. This is low in absolute and relative terms. Even though I am not a fan of Tim Cook, I think that Steve Jobs left him with a gem of a company. It is a cash cow and its momentum will carry it into its next success regardless of who is at the helm. So the decision to buy it here comes down to the technicals and the geopolitical headlines. 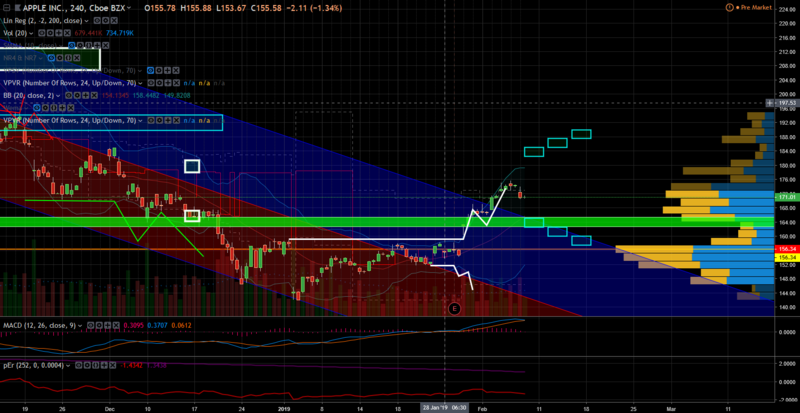 Technically it now faces resistance around the $175 level, AAPL is at such a level. So those who were stuck long through the dip could want to get out now. But this doesn’t change the ascending trend. I expect that Apple stock could fall to $165 levels, but that shouldn’t concern bulls at all. If the political rhetoric allows, it would then find footing to mount its next rally. So the those who want to buy the stock can wait for a fall to $165 as an entry point. Or for those who prefer to buy momentum they can wait until AAPL rises above $175.75 to chase it. If it closes above it then it would trigger a buy signal and the rally resumes. Given the quality of the company, unless I am an active trader and only looking for short term profits it won’t matter much over the long term. Years from now as long as markets don’t collapse AAPL stock will be higher. Usually I would also have an exit stop-loss plan, but AAPL is a stock I would keep for the long term. So unless the macroeconomic conditions deteriorate to the point that I have to abandon my overall bullish thesis, I will sit patiently through any short term dips. What I can do is take partial trades so I’d have the opportunity to average down if I don’t catch the bottom. Click here for a bonus video that I recently shared discussing GOOGL stock coming into the earnings. Nicolas Chahine is the managing director of SellSpreads.com. As of this writing, he did not hold a position in any of the aforementioned securities. You can follow him as @racernic on Twitter and Stocktwits. The post Get Ready for a Good AAPL Stock Entry Point appeared first on InvestorPlace.